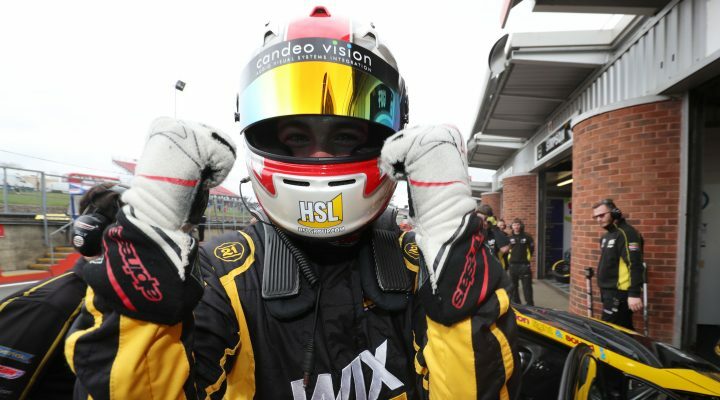 WIX Racing with Eurotech’s Jack Goff claimed the opening pole position of the 2018 Dunlop MSA British Touring Car Championship after a dramatic qualifying session at Brands Hatch. Goff set the pace early on in his Honda Civic Type R but he was soon pipped by a new qualifying lap record from Halfords Yuasa Racing debutant Dan Cammish. The Yorkshireman’s 47.946s lap time was hugely impressive and seemed almost certain for pole position – delight for his new employers at Honda. Disaster struck as the session edged towards its final ten minutes, however, when Cammish drove through a red light in the pit-lane. As per the regulations, it meant Cammish would have all of his previously set lap times removed due to the indiscretion, although he would be able to return to the action to put things right. With Cammish now dropped to the bottom of the order it was left to Team GardX Racing with Motorbase’s Sam Tordoff to sneak into second spot on his return to the series, whilst Team BMW’s Colin Turkington moved his 1 Series into third. It was all eyes on a fired up Cammish as the 28-year-old blasted his all-new Honda Civic Type R around the 1.2-mile circuit in the closing stages. He immediately launched his Japanese machine back up to sixth and then improved again to grab fourth. He had one final attempt before the chequered flag fell, but it wasn’t to be and the impressive new boy had to settle for a place on the second row of the grid. Andrew Jordan and Matt Neal ensured that both BMW and Honda would be further represented in the top six, whilst Tom Chilton completed his eye-catching day with seventh for Team Shredded Wheat Racing with Gallagher. Matt Simpson spent the entire day inside the top ten and backed that up with his best-ever qualifying performance. Simpson took eighth ahead of a slightly frustrated Tom Ingram, who had taken a berth on the front row for the last two seasons around the Indy circuit. Brett Smith made sure that both WIX Racing with Eurotech cars would score top ten positions as he also enjoyed arguably the most impressive display of his BTCC career so far. Reigning champion Ash Sutton endured an indifferent day as the Adrian Flux Subaru Racing star could only manage 18th on the grid, whilst his experienced team-mate Jason Plato was 29th. The competitiveness of Britain’s best championship was there for all to see with the top 30 cars separated by less than a second. When the dust settled, it was Goff celebrating his third pole position in-a-row, having taken top spot at Silverstone and Brands Hatch at the tail-end of 2017. Such has been Goff’s recent progress that some have tipped him for an outright title tilt this season, and this will surely have served to further fuel those predictions. Rounds 1, 2 and 3 of the 2018 Dunlop MSA British Touring Car Championship will take place at Brands Hatch tomorrow (8 April) with ten of thousands of fans expected to descend on the Kent circuit, with many more watching the action live on ITV4. Coverage gets underway on ITV4 at 10:30, with full pre-race build-up, before live and exclusive action of every race on the bill.